The action succeeded in getting a meeting with Jon R. Campbell, Head of Government and Community Relations for Wells Fargo & Company. The group hoped for a press release and a public announcement. They settled for a letter. We appreciate the dialogue with you this morning. As I shared, we deeply value our relationships with tribal communities and consider these relationships a point of pride for our company. We have been supporting Native American tribes across the country for more than 50-years, and are committed to continuing these relationships long into the future. As a follow-up to our previous discussions with the Standing Rock Sioux Tribe, we would be pleased to meet with a select group of tribal elders to discuss their concerns related to Wells Fargo’s investment in the Dakota Access Pipeline prior to January 1, 2017. We look forward to speaking with you or other tribal representatives in the coming days to agree on location, attendees, and agenda for this important engagement. As a company committed to environmental sustainability and human rights, we respect all the differing opinions being expressed in this dispute. Please let us know who should be the point of contact on your side. Mary Wenzel, head of Environmental Affairs, will be your point of contact at Wells Fargo. …. Wells Fargo has had its fair share of bad press lately, with a scandal around creating fake accounts. It seemed eager to tread lightly with the protest. Many police were on the scene at Wells Fargo, according to the livestream, but everything was mostly peaceful. It does not appear that Wells Fargo will press charges for the lock-down itself, according to what the Unicorn Riot reporter was able to glean from side conversations. However, as those involved in the protest left, police tried to detain one woman who had participated in the lock-down for an alleged assault on an employee (allegedly hitting someone in the face with a tube while the individual was trying to get to the elevators). Others who helped organize the protest said that violated an agreement that everyone would be free to leave. After a brief, tense exchange, everyone was allowed to leave. DAPL also crosses Iowa, and people there are protesting, too. The Des Moines Register reported yesterday: Two pipeline protesters arrested at Iowa Utilities Board. 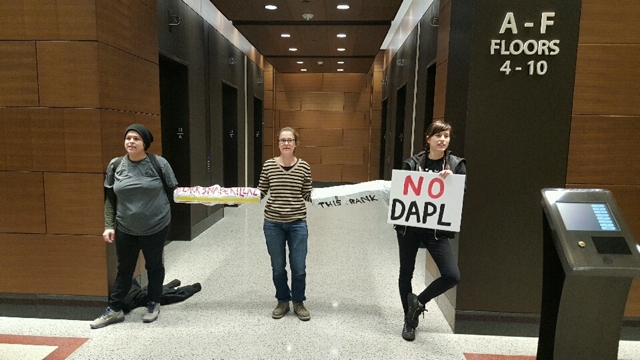 Two people protesting the Dakota Access oil pipeline were arrested Wednesday in Des Moines after demanding a meeting at the Iowa Utilities Board. Jessica Reznicek, who was arrested on a trespassing charge, had been fasting for 10 days with Travis O’Brennan, urging the board to revoke permits for construction on the Dakota Access oil pipeline in Iowa. With their supporters, Reznicek and O’Brennan have stayed outside the utilities board building on the Iowa State Capitol grounds during their fast.